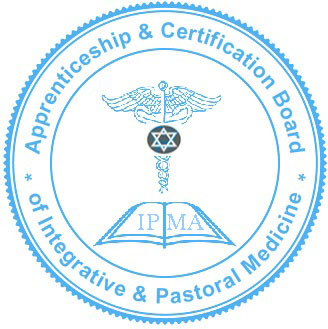 IPMA & Apprenticeship & Certification Board of Integrative & Pastoral Medicine®, is responsible for issuing Certification Marks and Regulating the Following Pastoral Medicine Professions. Application for Pastoral Medicine Licensure & Board certification is a voluntary contractual act entered into by practitioners who choose to practice the science of integrative pastoral medicine principles & recieve the legal rights and approvals to practice under National Class B Licensure according to the standards set by the AAIPM/ACBIPM.. The Licensure and certification is at all times considered a form of Pastoral Care. It enables practitioners who are grounded in orthodox healthcare and sciences to incorporate pastoral care/healthcare sciences derived from Jewish Talmudic Medicine teachings & Eastern cultures into their practice and to obtain a credential as a Federally registred certification mark,which attests to their knowledge & expertise in the field and affords them the recognition & practical rights of having met an identified peer-developed standard of achievement to practice this form of pastoral care under Ecclesiastical Jurisdiction of the AAIPM/IPMA with Federally Registered & recognized licensing. Integrative Pastoral Medicine Licensing is not designed to circumvent state licensing laws. Any practice prohibited in any state shall be prohibited under Pastoral Medical/pastoral counseling Licensing. As per the by-laws of Charter of the Articles of Association of the American Association of Integrative & Pastoral Medicine, Pastoral Medical/Counseling Licensing is not a license to "Practice Medicine, Nursing, Chiropractic Medicine, Naturopathic Medicine(in states where prohibited), Acupuncture, Osteopathy, Secular Counseling, Psychiatry, Dentistry, Surgery, Physical Therapy, Massage Therapy or any other practice tht is under the jurisdiction of State mandated licensing boards", unless one is a state licensed MD or other state licensed healthcare provider. In states that do no regulate natural or integrative medicine, but does not prohibit it, Pastoral Medical Licensures are designed to work under exemptions & exceptions State statutes & codes, including religious exceptions and such practices as pastoral counseling, religious practice and/or nutritional advice according to the specific state rules & the educational requirements to meet such exceptions & exemptions. Pastoral Medicine licensures & registrations specifies which State or Federal laws, codes & statutes as well as Pastoral Medicine statutes in which such practitioner is able to legally practice and incorporate into this form of pastoral care. Thus there is no confusion, mistakes nor errors in what such practitioner is licensed and authorized to use the AAIPM Certfication Marks Licensure for as it relates to their pratice..The AAIPM has a zero tolerance for anyone who violates our codes, state & federal laws.. Note: Due to high call volume and to commit our time and resources to administrative works and to reduce administrative costs, Please DO NOT call our office asking for additional information pertaining to Board Certification or Licensure. All information available is provided on our official website. It is YOUR responsibility to read all of the information and follow directions for licensure, irregardless of how much information is provided or whether or not you want to read it. Our representatives will simply redirect you to read the entire website. All fees, applications and information pertaining to our Legality, Registrations, Licensures, Intellectual Trademarks etc, are listed on each link to our site. NO EXCEPTIONS!!! Our phone lines are for practitioner inquries, filing a complaint or opening a case against a practitioner, support and administrative follow ups of our Practitioners and for confirmation of documents and other general questions related to educational courses for "practitioners" who are members of our Association. (Please note: despite the above requirements stating registration after licensure, our policy has changed. This certiication course must be enrolled into & completed "before full licensure & Board Certification" is issued. Enrollment & completion of the Pastoral Medicine Certification Course does not automatically mean applicant for licensure will be approved or issued a license upon application for a license, unless all requirements for licensure has been reviewed & met during initial application for both the IMPLEX exam & licensure. Application approval for licensure is dependant on applicants authentic qualifications, skills & academic education based on the standards & requirements for each of the Levels of Licensure or registrations listed below. Applicants also understand that the Non-Refundable donation fee's for the Pastoral Medicine Certification of 650.00 is seperate from the Application for Licensure & Board Certificatin Non-Refundable Donation fee of 470.00 (4.9% admin fee for all paypal payments). Board Certification will be issued upon successful completion of the 150 Hour PMC Course. We do issue "restricted provisional" licensure for the 1st year, while applicant enrolls into and completes the 150 Certification. Certification must be completed before the next licensure renewal. Failure to complete may result in licensure revocation and/or additional fee's for approved extensions under specific circumstances. Licensure and Board Certification must be kept active and renewed annually. Note: These instructions must be followed COMPLETELY: Failure to follow directions will result in Application not being processed & fee being non-refundable. Submission of signed Application with professional portfolio with evidence of education, transcripts, Degrees, diplomas & certificates from legally registered institutions that were in operation at the time of obtaining education. Must be Certified Copies of original documents via notary. Proof of clinical or residency training if applying at the Therapist or Doctoral Level. Payment of assessment fee 650.00 for 150 Hour Pastoral Medical Certfication + 470.00(for licensure). To be submitted via payment options below(Applicant may choose to pay for Certification only or both fee's to obtain a provisional 1yr restricted license). Please note: Payment must be made via online payments or money order only. Please do not mail Checks or Cash to the Administrative Office. We will not be held responsible for any payments sent via mail which may inadvertantly get lost. PLEASE CREATE AND KEEP WITHIN YOUR POSSESSION ALL ORIGINAL DOCUMENTS REQUIRED HEREIN, AS WE MAY RANDOMLY AUDIT PRACTITIONERS AND REQUIRE ALL ORIGINAL DOCUMENTS SENT TO THE AAPIM CORPORATE OFFICE FOR REVIEW. FAILURE TO KEEP ORIGINAL DOCUMENTS OR ANY FINDING OF FALSIFIED INFORMATION SENT VIA EMAIL OR FAX WILL RESULT IN A MINIMUM 5,000 PER DAY FINE FOR EACH DAY PRACTITIONER PRACTICES UNDER FALSE PRETENCES AS PER THE STATUTES AND BYLAWS OF THE AAIPM. If your application is denied, you will be refunded minus a 100.00 application and review fee. If your application was denied to due fraud, attempting to use fraudulent education from a diploma mill or any other scam will result in NON-REFUNDING of any fee's. By using this service you agree to be legally bound by all terms, statutes and policies stated herein. State licensed/registered practitioners may be exempted from taking Part 1 & Part 2 of the IPMLEX EXAM. All applicants must take Part 3 of IMPLEX Exam. Applicants who have not met the 100 hour Pastoral Medicine/Humanitarian Medicine requirements will be issued a Provisionary-Licensure permit and are required to take the Pastoral Medicine Certification course to meet the 100 hours mininum requirement and pass the Part 3 Pastoral Medicine Examination . Courses must be completed within the 1st year of licensure. Please allow 6 weeks for total review of all documents and to process application. Upon completion of review, we will schedule a phone, video/satellite or personal interview. **Applicants who are accepted will recieve a seperate license and board certification from respective Boards. Both must be renewed to remain active. **Licensures, Registrations & Commissions are to be renewed Annually. The Board Certifications are to be renewed Bi-annually. Licensure must be active and up to date in order for Board Certication to be valid. Board Certification must also remain active during the entitre duration of licensure..
Certification Marks(Licensure) and Board Certification are two seperate Credentials. The Health Professional Licensing Administration Board does not offer training or education for Licensure/Certification Mark® requirements. The Board of Examinars works with Approved or Recognized Institutions and Training Programs to insure educational, clinical and apprenticeship standards are met and that practitioner meets all the requirements set forth for BOARD CERTIFICATION only. We have a prophetic vision & mandate to equip & train Pastoral Medicine, Integative Medicine Doctors, Oriental Medicine Doctors & Naturopathic Physiciens with advance Rural Medicine & Humanitarian Medical knowledge & skills that would not only help them in professional practice, but would also create a team of advanced professionals who can work together in establishing a Major International Kingdom Humanitarian Mission & Research Center which would provide Integrative Medicine Disaster relief around the World. We would be effective in such a way that we would lead FEMA & other International humanitarian and medical groups & have more success using the Integrative medicines & methods that we currently use!! IPMLEX Exam- 4 Part Research Exam Required for Licensure to test competency in Biochemistry, Labs & Diagnosis, Anatomy & Physiology, Pathology, Orthomolecular Medicine & Nutrition, Patient Intake & Pastoral Medicine(note: we check all sources for Fraud and plagiarism. We will not tolerate fraud or plagiarism of any kind & it will result in denial of licensure & reporting to all other Certification & Licensing Agencies both private & government or revocation of License & Fines levied as per our policy. No refund will be issued for any Plagiarism, Fraud or Misrepresentation of credentials in order to obtain license. We reserve the right to civilly prosecute anyone who violates our policies). Part IV IPMLEX- Integrative Pharmacology Training Certification via approved Institutions for Board Certification Standards: These training standards are to certify that a practitioner is competent to administer evidence based naturally occurring substances to clients/patients based on their level of education, skills and experience. Practitioners are only authorized to prescribe Vitamins & minerals or herbal medicines within the level category in which they are certified. Qualifications to train at a certain level is dependant on practitioners Academic and clinical skills qualification and field of practice. Practitioners who have previous training in nutrition, homotoxicology,homeopathic, oriental medicine or naturopathic medicine may submit for a Pharmacology waiver or equivelency. Practitioners who score below a B(85%) average will be restricted & may only administer naturally occurring substance under the supervision & approval of the IPMA or approved Senior practitioner. NOTICE TO ALL Practitioners: Mandatory!!! Practitioners who violate or operate beyond the Board of Examiners Certification Pharmacology Certification Level in which he/she is certified or who dispenses any un-approved or unregistered Herbal supplement, regimen or tincture that is not in compliance with cGMP/FDA standards of manufacturing or who dispenses any Herbal, Naturopathic, Oriental or Homeopathic medicine requiring a prescription but has not been certified under Certification Level requirements or who has not recieved a waiver from ACBIPM Board of Examiners or who recommends, suggests or advices any client to take any supplements, that poses a significant risk to ones health, that practitioner is not adequately competent in or acts in any manner of negligence in regards to prescribing "naturally occurring substances" or un-authorize federal/state controlled Drugs Rx, will be subject to disciplinary action, which may include but is not limited to referral for licensure suspension, restriction, revocation, reprimand &/or fines, as determined by the IPMA Board of Arbitrations & Investigations, in the code of ethics of the Integrative Pastoral Medical Association. All Licensees are legally & contractually bound to adhere to all rules, regulations & codes of the IPMA & Federal, State & Local Laws.